Portfolios are a great way of showing off your work to customers and clients. As you would expect, WordPress makes this task incredibly easy. All you have to do is upload your images and WordPress will take care of everything else. The core version of WordPress comes with basic gallery functionality. It is sufficient for displaying some images in a blog post or page; however it is not the most stylish or professional looking solution. There are far more attractive options available to WordPress users. In this article, I would like to share with you a collection of the best WordPress portfolio plugins available online. These will help you portray your images in a more professional way. The first plugin in our list is the aptly named WordPress Portfolio Plugin. It can be used by businesses and designers who want to show off the websites they own or have designed. All you have to do to add a website to your portfolio is add the name, URL, and description of the website. 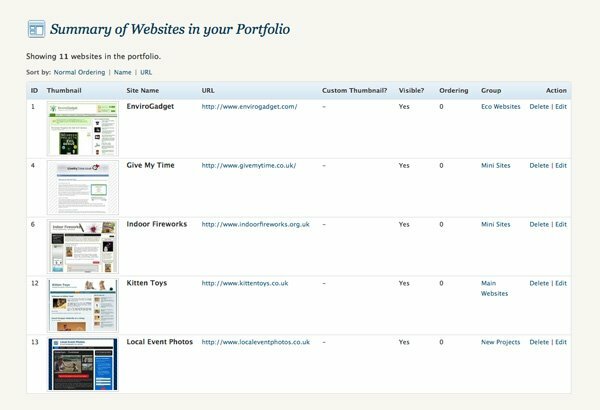 Websites can be assigned to groups to help you organise your portfolio better. An efficient way of displaying a portfolio of websites on a WordPress page. OTW Portfolio Light is a clean portfolio plugin that will display portfolio items on a three column template. Portfolios can be inserted into posts or pages using shortcodes. One shortcode will display portfolio items using a paginated template. Another will allow you to filter items by portfolio categories. The dimensions of thumbnails and single images can be modified through the settings area. Despite its name, there is no premium version of the plugin; however the plugin has everything you need for adding a minimal style portfolio to your website. OTW Portfolio Light is a a clean and practical portfolio solution. A filterable portfolio plugin from Nimble 3 that uses a custom post type to store portfolio items. It has support for images and videos from YouTube and Vimeo. Portfolios can be inserted into posts and pages using shortcodes or into templates using PHP. The default layout displays portfolio items in circles, however images can also be displayed in squares/rectangles if you use different code. A premium version of the plugin is available for £14.99 that gives you more filtering options and the ability to manage multiple portfolios. A useful plugin that has displays portfolio items in rectangles or circles. Aeolus is a beautiful portfolio plugin that uses custom post types to store images and videos. Large images at 1980 by 1080 pixels can be assigned as featured images. Videos can be featured too. The settings area lets you change the slug that is used in page portfolio URL’s. You can also change the number of portfolio items that are displayed on a page, change the labels that are used, and adjust the primary color scheme. Shortcodes can be used to insert portfolios into posts and pages. By using a custom shortcode, you can display items from a specific category and change the number of columns of items that are shown. Aeolus is a versatile portfolio plugin that lets you customize the look of items using shortcodes. Rio Portfolio is a portfolio plugin that supports videos, links, and images. It uses custom post types to store data and uses jquery filteration to display a paginated menu of items. Portfolio items can also be assigned to categories. The plugin settings area allows you to define the thumbnail image size and the number of items that are displayed. Portfolios can be inserted into your articles using shortcodes. Rio Portfolio is a simple yet elegant portfolio solution. Awesome Filterable Portfolio is a useful plugin that lets you add a lot of information to portfolio items. For example, you can include a long description, the name of the project, the client it was created for, and the URL of the project. All information is stored in a custom post type. Thumbnail images have to be created manually, which is a bit of a pain; however, the plugin allows you to create categories and assign items to them. When a visitor clicks on a different category, the new images will load quickly using a smooth jQuery animation. A flexible portfolio plugin that lets you display a lot of information about items. Portfolio lets you add a page that displays portfolio items. Additional fields can be displayed with images including date, description, short description, link, and more. 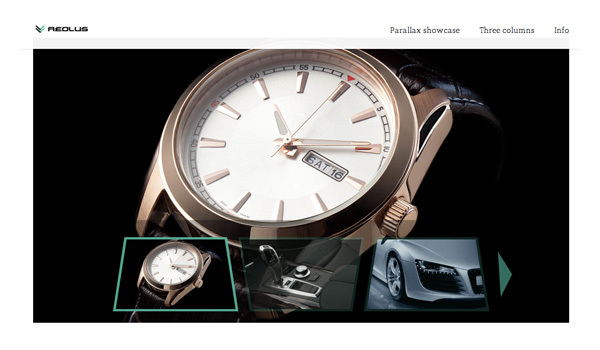 The page template will display all portfolio items on one page. You can define the image thumbnail size and number of columns through the settings area. Image thumbnails will automatically be regenerated if the thumbnail size is modified. 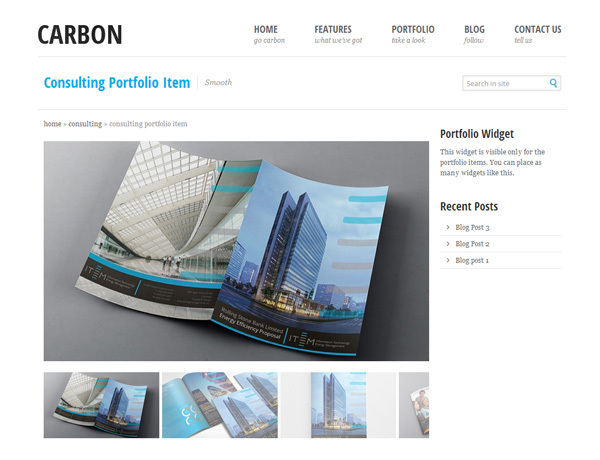 Portfolios can then be displayed on your website by inserting a shortcode into a post or page. Portfolio allows you to define several fields for each portfolio item. Easy Portfolio is a simple portfolio plugin that lets you upload images and assign them to categories. Shortcodes can be used to display a specific portfolio, the number of items that are displayed, and the order in which they are displayed. Via the post editor, you can define the project description, URL, meta title, and meta description. This is useful if you want to use the plugin for showcasing projects. Easy Portfolio can be used to display project details and images. 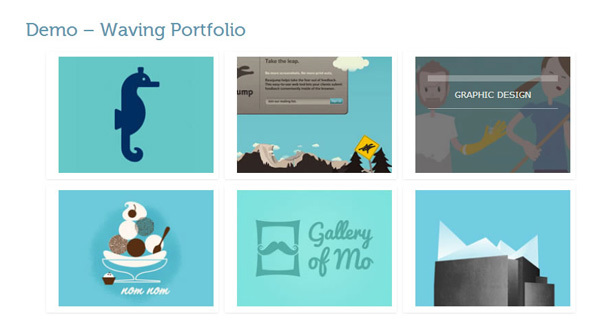 Waving Portfolio is a beautiful free portfolio plugin that can display portfolios in a grid. Shortcodes can be used to add your portfolio items to your website. The width of portfolio images, the color scheme, and the number of items shown, can all be changed through the shortcode. When a visitor clicks on a grid item, the portfolio is displayed using a cool pop up. 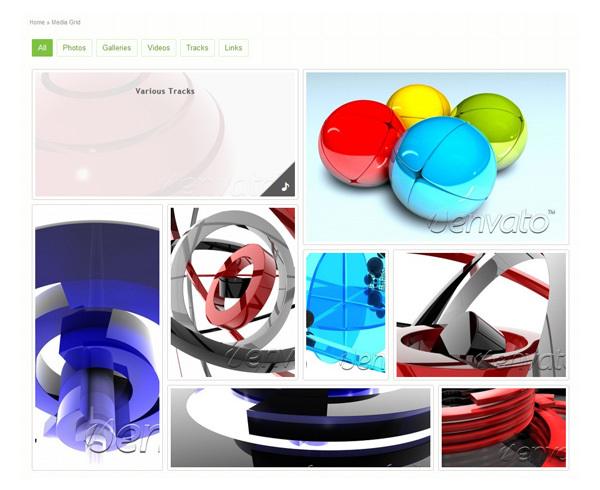 The name and description of the portfolio is displayed, together with all portfolio images. Waving Portfolio is a great way of showcasing the websites you own or the designs you have created. 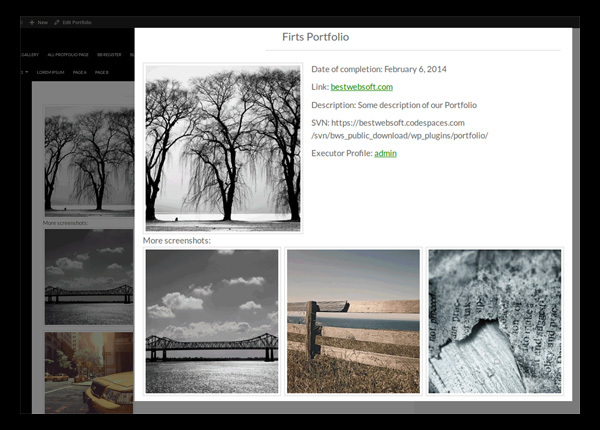 Portfolio Mgmt registers a custom post type for portfolio items. Or as they refer to it “Case Studies”. The client name, project URL, and project description, can all be defined. Portfolio tags can be assigned too and there is a widget for displaying portfolio items. Portfolio Mgmt. is a basic portfolio template that lets you add information to items. Easy Media Gallery is a responsive gallery and portfolio WordPress plugin that lets you display images using a gallery or portfolio. Video and audio are also supported. In the settings area, you can customize the color scheme. This is a nice addition that few other free portfolio plugins offer. A pro version of the plugin is available from $24 that adds many more features. This includes the option of displaying grid galleries, photo albums, portfolios, and image sliders. 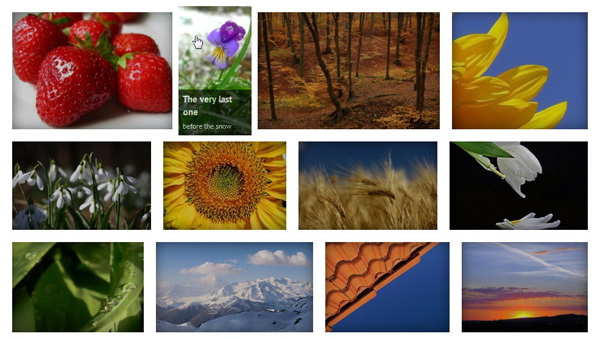 Easy Media Gallery is an easy to use portfolio plugin with lots of features. Go is a responsive portfolio WordPress plugin that comes with four unique styles, Google web font support, and an options panel with many configuration options. Images, video, and audio, are supported. Portfolio items can be displayed in a grid or horizontal slider layout. The plugin also includes a built in template and style editor for customizing the layout of your portfolio. Go is a stylish portfolio solution that has many configuration options. Media Grid is an interesting portfolio WordPress plugin that lets you create unique grid layouts using a visual layout builder. It supports every type of media including images, videos, links, and audio. An image slider is also included and there is an option to disable right clicking for images. Social media icons can be displayed on portfolio items. The style of the grid can be changed through the settings area. A custom CSS box is also available for customizing things further. 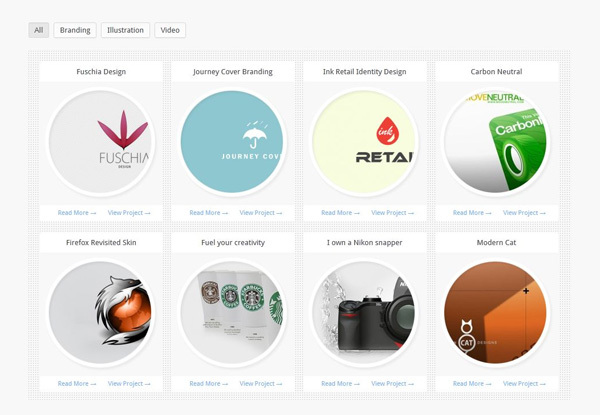 Check out the plugin demo to see the portfolio in action as it looks great. 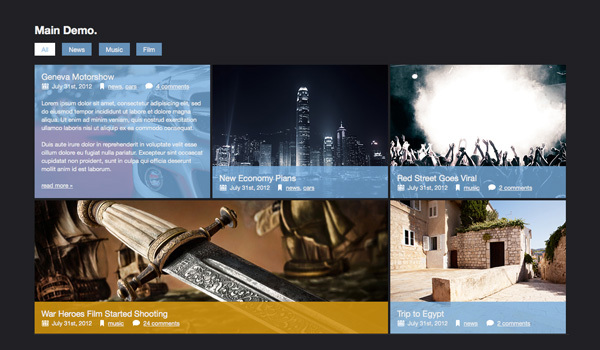 Media Grid is stylish, highly configurable, and packed full of features. ZoomFolio is a beautiful touch enabled responsive portfolio plugin that comes with ten unique skins. Several post types are supported including images, video, audio, testimonials, and YouTube. Portfolio items are displayed beautifully using lightboxes. A shortcode generator allows you to insert your portfolio into any page. 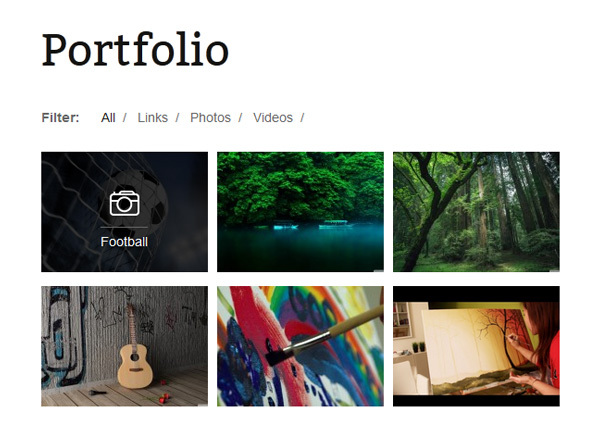 Portfolio items can also be integrated with a recent posts plugin. ZoomFolio is an attractive portfolio solution that looks great on mobile devices. 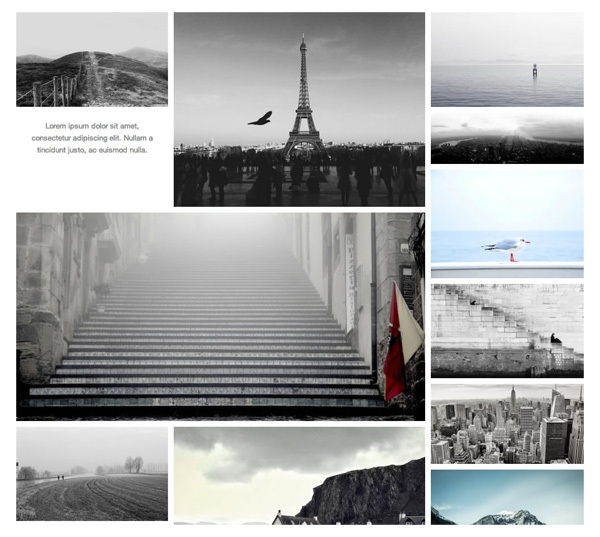 Auto Grid Responsive Gallery is a beautiful portfolio plugin that displays images in a grid. The plugin is responsive so will adjust the width of the gallery when someone changes the size of their browser. As the visitor scrolls down the page, more images are loaded dynamically. Images are displayed using a lightbox and slideshow. You can add new images to a folder using file transfer protocol and then assign them to categories. Auto Grid Responsive Gallery is a modern portfolio plugin that looks great on any device. UberGrid is a responsive grid portfolio plugin that lets you build a grid of images using existing posts or products. It features a built in lightbox that supports images, videos, Google Maps, and text. Five other lightboxes and twelve layouts are included too. The output looks great, with CSS3 animations and effects being used to great effect for transitioning between images and categories. 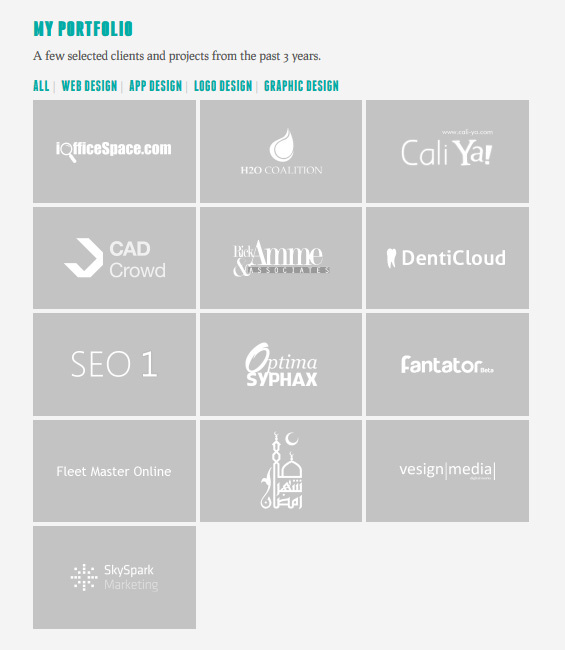 UberGrid is a stylish portfolio plugin that comes with lots of templates. Justified Image Grid is a feature packed responsive portfolio plugin that packs over 300 settings. It can display images from your media gallery, blog posts, RSS feeds, Facebook, Instagram, Flickr, and more. The plugin gives you so many ways to display images. There are several lightboxes to choose from, unlimited color schemes, and an option to add effects to your thumbnail images. Justified Image Grid offers a wide range of grid based layouts for your portfolio. Final Tiles Grid Gallery is a mobile friendly WordPress plugin that can be used to build beautiful portfolios. Six lightbox styles are included with the plugin and there are many different grid layouts available. Captions can be added to images and it utilizes cool hover effects when you point your mouse cursor over an image. Social media links can also be integrated into images. A beautiful responsive portfolio plugin that has cool hover effects. Grid FX is a versatile portfolio plugin that comes with four unique styles. It can build portfolios using images, blog posts, videos, audio, and WooCommerce products. Grid or masonry portfolios are supported. Over 80 settings are available, including styling options and custom CSS, layout, pagination, lightbox settings, and more. Grid FX is the self-proclaimed “Ultimate Grid Plugin for WordPress”. 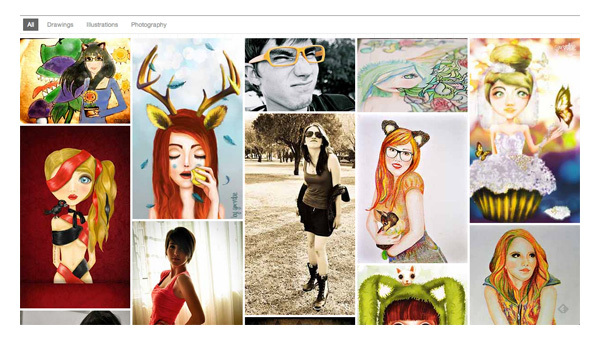 PhotoMosaic presents your portfolio images in a beautiful masonry gallery layout. Images are loaded quickly using the packaged PrettyPhoto lightbox plugin. It is one of the few premium portfolio plugins that integrates with the WordPress gallery system. The plugin also comes with a widget to display your portfolio items in your sidebar or footer. PhotoMosaic is a fast loading responsive portfolio plugin. If you are an Elegant Themes member, then we have some great Portfolio Themes that can also be used to create beautiful galleries (if these plugins don’t give you the functionality you are looking for). I would like to share with you two fantastic portfolio themes that are included with your Elegant Themes membership. These are always a great alternative to using a portfolio plugin. Origin is a beautiful responsive portfolio WordPress theme that displays images in a grid style. Grid images link to blog posts, however the theme also comes with four different portfolio templates. A stylish image gallery is included too. The theme utilizes the WordPress theme customizer. This allows you to change the color scheme to whatever you want. As with all Elegant Themes designs, shortcodes can also be used to style content. Origin is a great way to showcase images to the world. If you really want to showcase your images, I recommend checking out Gleam. 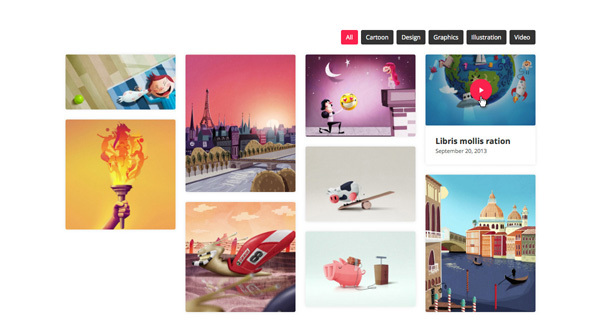 The theme’s portfolio template displays images across the whole screen. A traditional grid style gallery template is also available and custom backgrounds can be assigned to each post to give them a unique look. Background images also change frequently using AJAX loading. It is a nice effect that works without the user having to reload their page. Gleam is a stylish portfolio theme that will display images in full screen. As you have seen, portfolio plugins can be used to display your images in a more professional way. I hope this article has given you some ideas as to what you can use on your website to display your work. Nice list of portfolio plugins. I would love few of them to try out. Thanks for the post Turd Breath! Divi also has a great portfolio module built into it. Overall, Divi is a superb theme. I recently became an Elegant Themes member solely because of how great it looked. Click on any of the thumbs in the above page, and you will see that the full-size photos differ significantly from the thumbnails. And if you scale your browser down to “mobile” screen size, you’ll notice that the cropping of each thumbnail actually changes, which I find to be bizarre and unnecessary. I put in a tech support request to see if some code could be inserted which would display thumbs that actually match the original images. ET support has been corresponding with me, however after two weeks there still isn’t a fix for this very basic issue. Ultimately, if it is impossible for Divi to display thumbnails that match my original images (which use standard photographic aspect ratios), I may have to ask for a refund. With a Porfolio theme, one expects to be able to showcase his/her work without it being cropped or stretched — even in thumbnails. Any update to this? I like the Divi theme a lot and have found the support team to be very responsive. Was this post applicable to Divi 2.0 (asking because I’m about to build a gallery using the theme). I have the same issue. My client needs to show their products and thumbnail cropping cuts of the product image. I tried to use an image in the same aspect ratio of the thumbnail but it does not respect the aspect ratio and crops it. Any response on their side on how to avoid this problem? I have exactly the same issue. I have a client who is a photographer and needs to choose the portion of the image to show as a thumbnail. I use the built in WordPress crop tool, select “Use as Thumbnail” and it shows in the admin area as the correct thumbnail. On the front end, divi does its own thing and creates a cropped version which missed the main part of the image (especially when its a portrait image). This is a big issue, and I also love Divi. PLEASE PLEASE provide a fix for this. Will I’m in the same situation as you. I really need to have my thumbnails as sections of the image, not an altered picture. I too may have to ask for a refund, if this cannot be fixed. Have you had any luck since this post? Oh no!! I really thought I was missing something in the tutorials. Huge problem, I do need that portfolio in my website. How can we fix it? Anyone? Or how can we put some more pressure on the Tech Support? Any ideas? Or if that doesn’t work, does anyone know a good alternative portfolio (and shop) theme, after I got my refund of Divi? Thanks! Nice list. I never heard of many of these before. I will have to check them out. Good list. I was just about to drop the $24 for the pro version of Easy Media, I use the free one now. I need to integrate images and videos and have some layout options but not so many options that I can’t figure out how to get it to work in a semi reasonable amount of time. I think I need to do a bit more research now. There are some really cool looking plugins for portfolios. Any name of a plugin working like Filtrify? Like Alain I’d also like to know if there’s any filterable portfolio plugins that can filter multiple taxonomies – I’m using Divi now which is great but filters only one category at a time. EG if I have colours and shapes I want to be able to see just the red squares and not green ones. Is there anything out there? Ideally that just integrates into Divi? The best one out their other than Media Grid is Essential Grid http://codecanyon.net/item/essential-grid-wordpress-plugin/7563340 that has been available since April. Media Grid is great but it does not have pagination and EG has controls for mobile and tablets. You should check it out. Great collection of portfolio plugins. Can any WordPress portfolio plugin that display portfolio items with auto scrolling? Good information ET team. Thanks Guys !! I personally don’t like to use plugins for portfolios. However, even if i use, most of these plugins support single portfolio format. People are interested in viewing various portfolio formats at a time; such as video format, image format, gallery format, slideshow format and so on. Though, there are several plugins to support single or multiple formats at a time. 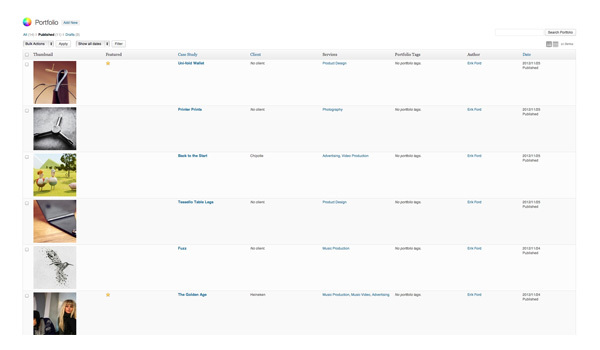 It is still sad that not many of our WordPress themes are built to support such multiple formats at a time. Furthermore, even if some plugins have supported multiple portfolio formats, they are limited to two or three portfolio formats only; Also, these plugins appear to be very sparse and with fuzzy navigation options. We are still looking forward for good themes that support multiple portfolio formats that can be navigated on a single stretch and with easy navigation and standard filter options. Great post Kevin, what about Nextgen portfolio plugin and uSquare? I love uSquare and apart from using it as a portfolio, you can use it to publish your team members, blog post, and gallery. It has a flexible backend and hight standard quality code. Great selection. I personaly use Origin (child theme) to show my works. But I regret that all pictures in the home page have the same size. I would like a result like with Auto Grid Responsive Gallery (portrait, landscape or square) to respect the origin pictures. Is that possible ? Do I understand that these suggested Plugins will work with all Elegant Themes? I’ve been using NextGen gallery pro for a while now. It’s been really cool. Thank you Kevin. This is a great source of portfolio plugins for anyone lacking the experience of the many WordPress pros. It’s refreshing to read post that help so many learning WordPress. I certainly enjoy being an Elegant Themes member too. Responsive Portfolio for WP and Media Grid are the two best wordpress portfolio plugins ever that I always prefer to use on my WordPress blogs. BTW thanks for sharing this useful collection. Most of the plugins you have shared here are new to me. Surely I’ll try few of them. Thanks for the share. i only used the divi portfolio so far and it’s good enough for my needs. Also the Gleam theme is excellent for a standalone portfolio. – Now you can generate as many autonomous portfolio lists as you want with the help of the new (tag) attribute for the shortcode. – Adding new capability to enable/disable categories menu. – Category menus are selected according to the tag filter the admin has enabled, so only related categories will be shown inside the menu. Excellent collection of portfolio plugins Kevin, I gone through many blogs and articles but you have shown and shared some great plugins with adding description to it. Thank you for your good work. I like your posts and subscribed for notifications to your next posts. I have been an Elegant Themes member for more than a year and a half now. I have to say that Divi is the best theme with no doubt, but it would be great if we can have more skins for blog, for example a mix between Origin theme and Divi or maybe the same option that we have on Divi to create fullwidth grid portfolios but linking to posts. Or even better, a grid where we can have posts, portfolio, videos, etc. Can you tell me if most or all of these portfolio plugins will work with Divi? I’m on the verge of buying Divi, but I’d really like to integrate additional portfolio plugin options such as “Media Grid” and/or “Go”. I’m guessing/hoping that they will work just fine in Divi. Excellent list. For premium I like with justified image grid, there is some presets that we can choose for different look. Hi Elegant Themes Staff , I’m trying to find a plugin for displaying products, similar to an e-commerce but without cart process, you can suggest someone?